On August 21, 2017, millions across the United States will witness an amazingly rare and wondrous spectacle of nature—a total eclipse of the sun. The Great American Total Solar Eclipse will darken skies all the way from Oregon to South Carolina—a stretch of land about 70 miles (113 kilometers) wide. This has not occurred since 1776. Many communities are hosting “eclipse parties” at museums, observatories, parks, open fields, and back yards. 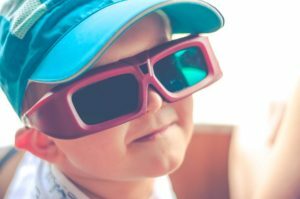 Schools that are in session are preparing a variety of lessons to make the most of the eclipse experience while keeping the kids safe with protective eyewear and adult supervision. Other districts called an inclement weather day so children would not be outside unattended during the eclipse. Astronomy and astrophysics graduate student at the University of Arizona, Noah Rivera said, “The eclipse is of particular importance to my department. Multiple astronomy professors plan to view the eclipse at more desirable locations outside of Tucson, which has led my first day of class to be rescheduled. A total solar eclipse happens when the moon’s shadow will completely cover the sun on Earth, fully or partially blocking the sun’s light in some areas. If a solar eclipse is total at any point on Earth, it is called a total solar eclipse, even though it’s seen as a partial solar eclipse in most areas. Observers within the path of totality will be able to see the Moon cover up the Sun little by little (using eclipse glasses), until for just maybe a minute or two (depending on your exact location), the Moon completely covers the Sun! During that brief period, the Sun is being totally eclipsed. There is no bright part of the Sun that is visible anymore because the Moon is completely covering it—appearing as day turning to night. It is being called the great American eclipse because totality will sweep the nation from the Pacific to the Atlantic. 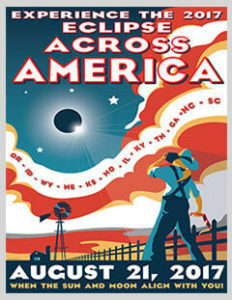 The path of totality passes through Idaho, Wyoming, Nebraska, Kansas, Missouri, Illinois, Kentucky, Tennessee, Georgia, North Carolina and South Carolina (a total of 70 miles). The timing of the total solar eclipse and its duration both will depend on where you are inside the path of totality. 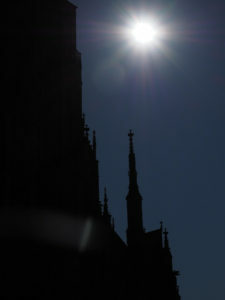 The eclipse stretches across the country starting at 12:05 Eastern time in Salem, Oregon, lasting (in total across the U.S.) for four hours and 29 minutes, until finally being visible in Charleston, South Carolina. The moon will completely cover the sun, at most, for 2 minutes and 40 seconds for observers positioned anywhere along the center of the path of totality. As you move toward the edge of the path, the duration of totality will decrease. Those at the very edge of the path may observe totality for only a few seconds. 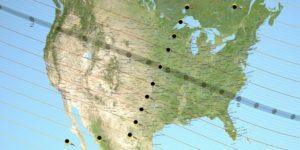 After the 2017 solar eclipse, the next total solar eclipse visible from the continental United States will be on April 8, 2024, above Mexico and Texas, up through the Midwest and northeastern U.S.
NASA representatives predict Aug. 21, 2017, may be one of the worst traffic days in national history. About 12 million people live within the narrow band of totality, yet, approximately 25 million reside within a day’s drive of it. 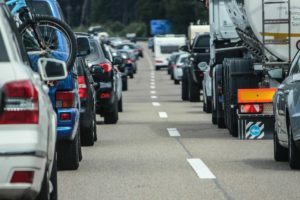 The agency advises planning extra time for travel. Hotels near the path of totality have likely been booked for months, so you may not be able to stay in the path the night before. Is the total eclipse a sign from God? The total eclipse may be a sign from God according to some Bible scholars. Jewish rabbis have historically viewed solar eclipses as warnings from God to Gentile nations. The Scriptures show that God uses signs and wonders in heaven to communicate with His people. The sun, moon and the stars can be looked at as signs of importance. This certainly could include rare solar eclipses. Pastor Mark Biltz, author and the man who discovered the “Blood Moons” phenomenon, suggests there may be something more to the eclipse. Such as a direct warning to the United States. According to Biltz in an interview with WND, “From a biblical point of view, a solar eclipse is meant as a sign from God. In Genesis 1:14, God declared this to be so. It is a sign that is beyond man’s control, something he can’t manipulate. Solar eclipses become biblically and prophetically significant and relevant when man understands their timing according to the biblical calendar and where they happen. Then we look for the patterns. Whether the conjecture regarding America’s Great Eclipse is accurate, we know our nation and our world are living in tumultuous times. Using this time of viewing the wonders of our creator is an opportunity for us all to get right with God, share the gospel, and to pray. Do you have any special plans to view the eclipse? Let us know!